Website and processes: 2 Nov 16 JT, 5/5 Excellent "Clear, concise and exciting!" You will start by receiving a briefing which normally takes place by the helicopter and which lasts about 15-20 minutes. At the briefing we try and explain in simple terms how the helicopter works. The instructor will then get the machine airborne after carefully warming up the engine and carrying our essential pre-flight checks. 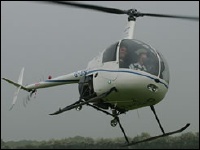 We then climb away to the North to fly over the beautiful Leeds Castle, at that stage you will be piloting the helicopter! We then turn back to the airfield where you can then try hovering perhaps one of the trickier sides of helicopter flying. Do take a camera with you if you wish, it will certainly be worth it! Maximum weight of recipient 15.5 stone, Maximum height 6' 5". Please call on day to check conditions suitable for flight. We therefore need a contact telephone from you when the booking is made so that we can contact you in the event of problems.